To Cite: Kianmehr Z, Kaboudanian Ardestani S, Soleimanjahi H, Fotouhi F, Alamian S, et al. Comparison of Biological and Immunological Characterization of Lipopolysaccharides From Brucella abortus RB51 and S19, Jundishapur J Microbiol. 2015 ; 8(11):e24853. doi: 10.5812/jjm.24853. Background: Brucella abortus RB51 is a rough stable mutant strain, which has been widely used as a live vaccine for prevention of brucellosis in cattle instead of B. abortus strain S19. B. abortus lipopolysaccharide (LPS) has unique properties in comparison to other bacterial LPS. Objectives: In the current study, two types of LPS, smooth (S-LPS) and rough (R-LPS) were purified from B. abortus S19 and RB51, respectively. The aim of this study was to evaluate biological and immunological properties of purified LPS as an immunogenical determinant. Materials and Methods: Primarily, S19 and RB51 LPS were extracted and purified by two different modifications of the phenol water method. The final purity of LPS was determined by chemical analysis (2-keto-3-deoxyoctonate (KDO), glycan, phosphate and protein content) and different staining methods, following sodium dodecyl sulfate polyacrylamide gel electrophoresis (SDS-PAGE). C57BL/6 mice were immunized subcutaneously three times at biweekly intervals with the same amount of purified LPSs. The humoral immunity was evaluated by measuring specific IgG levels and also different cytokine levels, such as IFN-γ, TNF-α, IL-4 and IL-10, were determined for assessing T-cell immune response. Results: Biochemical analysis data and SDS-PAGE profile showed that the chemical nature of S19 LPS is different from RB51 LPS. Both S and R-LPS induce an immune response. T-cell immune response induced by both S and R-LPS had almost the same pattern whereas S19 LPS elicited humoral immunity, which was higher than RB51 LPS. Conclusions: Purified LPS can be considered as a safe adjuvant and can be used as a component in prophylactic and therapeutic vaccines targeting infectious disease, cancer and allergies. Microbial pathogens capable of establishing chronic infections have evolved strategies to actively modulate the host immune response. Members of the genus Brucella are facultative intracellular pathogens that can induce chronic infection named brucellosis in humans and domestic animals around the world (1). Upon infection by Gram-negative bacteria, for instance Brucella, one of the primary targets that are exposed to the host cells is lipopolysaccharide (LPS). In fact, LPS is the most important virulence factor, the major antigenic and immunogenic structure on the surface of Brucella, as LPS deficient strains have less virulence and intra-cellular survival potency (2) LPS is an activator of innate immunity via interaction with membrane receptors on target cells such as Toll-Like Receptor 4 (TLR4). Binding of LPS to TLR4 triggers signal transduction and leads to the release of a number of pro and anti-inflammatory cytokines i.e. Tumor Necrosis Factor-α (TNF-α), interleukin-6 (IL-6), IL-12, IL-10 and adhesion molecules (3, 4). Also, LPS as a potent antigen, is known to induce specific humoral response in infected hosts by activating B lymphocytes and inducing the production of antibodies without the apparent contribution of T cells, thus LPS is traditionally described as a T cell-independent antigen (5). Most biological activities induced by Brucella LPS are quantitatively and qualitatively different from enterobacterial LPS, which may be related to the unique composition of Brucella LPS (6, 7). In contrast to many endotoxins, Brucella LPS has non-pyrogenic and less toxic properties (8). At least 10 times more Brucella LPS is needed for lethality and interferon production compared with enterobacterial LPS (6, 9). On the basis of LPS structure, different strains of Brucella are classified to two groups including those that express smooth LPS (S-LPS) and those that express rough Lipopolysaccharide (2). Most wild-type Brucella species have S-LPS, which is an amphipathic molecule with three covalently linked regions: O-specific polysaccharide (O-antigen), core oligosaccharide and lipid A. However, R-LPS lacks O-side chain polysaccharide and in the case of B. abortus, the loss of the O-side chain correlates with decreased virulence in animal hosts (10). The O-side chain of Brucella S-LPS is an unbranched homopolymer of 1, 2-linked 4, 6-dideoxy-4-formamido-α-D-mannopyranosyl usually with an average chain length of 96 to 100 glycosyl subunits (11, 12). The O-side chain is an immunodominant antigen since a major proportion of the antibody response of individuals infected or immunized with smooth Brucella species is directed against this antigen (13). Brucella abortus strain 19 (S19), which has been formerly used as a vaccine for prevention of brucellosis in cattle, induces the production of antibodies to the O-side chain of LPS (14). A major problem of this vaccine is that vaccinated animals cannot be clearly differentiated from infected animals by the current serological tests (15), while the vaccine may also induce abortions in pregnant animals (2). Brucella abortus strain RB51 (SRB51) is a rifampin-resistant, stable rough mutant derived from the standard smooth virulent strain 2308 of B. abortus. The SRB51 has attenuated virulence and its LPS is highly deficient in the O-side chain that is found in parenteral smooth virulent strain 2308 and also S19 (16). Furthermore, SRB51 has been widely used as a live vaccine and an alternative to S19 for preventing brucellosis in cattle, because unlike S19, it does not induce antibodies to the O-side chain. The SRB51 cannot replicate within macrophages (17) and at similar concentrations, induces lower protection compared to S19 due to the lack of protective antibodies to the O-side chain (18). In the current study S-LPS and R-LPS were extracted and purified from B. abortus S19 and RB51, respectively. The final purity of the LPSs was determined by chemical analysis and sodium dodecyl sulfate (SDS-PAGE)-polyacrylamide gel electrophoresis. Regarding the different chemical properties of S19 and RB51 LPS, the aim of this study was to compare their immunostimulatory properties through evaluation of humoral and cell-mediated immunity in mice. To achieve this aim, C57BL/6 mice were immunized with same amounts of purified S-LPS or R-LPS. The humoral immunity was evaluated by measuring the specific IgG levels in serum and also different cytokines levels such as IFN-γ, TNF-α, IL-4 and IL-10 were determined for assessing T-cell immune response. Female C57BL/6 mice (six to eight weeks old) were purchased from the Pasteur Institute of Iran (Tehran, Iran) and were used for experimental purposes with approval of the animal ethics committee of the Ministry of Health and Medical Education (Tehran, Iran). Brucella abortus S19 vaccine strain and Brucella abortus RB51 were obtained from the type bacteria collection of Razi Institute of Iran (25th Km of Tehran-Karaj Highway, Iran). The bacteria were routinely grown on Brucella agar medium (Merck, Darmstadt, Germany) at 37 ± 1˚C for 72 hours. Next, the bacteria were propagated into roux culture flask containing Brucella agar at 37 ± 1˚C. After 72 hours of incubation, the bacteria were inactivated with 0.5% phenol and harvested by centrifugation. S-LPS was extracted from the bacterial cells using the hot-phenol method, as described previously with some modification (19-22). Briefly, 3 g portions of wet weight of bacterial cells was suspended in hot distilled water (67˚C), followed by the addition of an equal volume of phenol (Merck, Germany) solution (90% w/v,), and maintenance at 67˚C for 15 minutes. The mixture was cooled on ice and centrifuged at 8,000 g and 4˚C for 30 minutes. The phenol layer (lower phase) containing LPS was removed. The LPS was precipitated by adding three volumes of cold methanol reagent (99% methanol, 1% sodium acetate; Sigma-Aldrich, Germany). The precipitant contained S-LPS and also other bacterial components such as proteins, nucleic acids and polysaccharides, apparently associated with S-LPS by strong non-covalent bonds. In order to reduce some contaminations, precipitated LPS was dissolved in 20 mL of dimethyl sulfoxide (Merck, Germany) and stirred for 20 minutes at Room Temperature (RT). Next, to disrupt the non-covalent associations between LPS and other bacterial components, 20 mL of 4 M NaI (Merck, Germany) as a chaotropic agent was added and the solution stirred slowly for 20 minutes at RT. The S-LPS was precipitated by adding three volumes of cold methanol reagent and stirring for one hour at 4˚C. The mixture was centrifuged at 8,000 g and 4˚C for 15 minutes and the supernatant was discarded. The S-LPS-containing pellet was dissolved in 40 mL of double-distilled H2O and stirred slowly overnight at 4˚C and then centrifuged at 8,000 g and 4˚C for 15 minutes. The procedure was repeated and the supernatant (aqueous solution of S-LPS) was removed to the other tube and the procedure was repeated. The pooled S-LPS solution was loaded in dialysis tube and concentrated through pushing with poly ethylene glycol 6,000. For further enzymatic digestion, DNase (10 unit/mL), RNase (Qiagen, Germany) (10 unit/mL) and proteinase K (Merck, Germany) (100 µg/mL) were added to reduce nucleic acid and protein contamination of the extracted LPS sample. Also, for additional removal of protein contamination, 5% Trichloroacetic Acid (TCA) (Merck, Germany) was added to the sample and the solution was stirred slowly for three hours at 4˚C. To facilitate protein precipitation, the mixture was centrifuged at 5,000 g and 4˚C for 30 minutes and the supernatant was dialyzed at 4˚C for three days against ddH2O with several changes of ddH2O, and finally lyophilized. Furthermore, 30 mg portions of lyophilized LPS were dissolved in 600 µL of 6 M guanidine HCl (Sigma-Aldrich, Germany) in 0.2 M Tris hydrochloride (Sigma-Aldrich, Germany) (pH 8) and chromatographed in a Sephacryl S-200 column (30 by 1 cm), equilibrated with the same buffer. Two milliliter samples were collected and the presence of LPS was monitored by cold methanol (Kiankaveh, Iran) reagent precipitation and Thin-Layer Chromatography (TLC) (23). The first peak, obtained in the void volume of the column, contained the LPS, which was precipitated with three volumes of cold methanol reagent and sedimented at 8,000 g and 4˚C for 15 minutes. The LPS pellet was finally dissolved in 10 mL of ddH2O, dialyzed against multiple changes of distilled H2O at 4˚C for five days, and finally lyophilized and stored at -20˚C. Rough-Lipopolysaccharide from B. abortus strain RB51 was prepared by the method described by Moreno et al. (20, 24). Briefly, 40 g wet weight of RB51 cells were extracted for removing protein with 2.5% NaCl (Merck, Germany) at 4˚C for two days. The mixture was centrifuged at 8,000 g and 4˚C for 30 minutes and the supernatant was discarded. The cell residues were freeze-thawed and then suspended in phenol-chloroform-petroleum ether (2:5:8, v/v/v) and centrifuged at 8,000 g and 4˚C for 30 minutes, and the supernatant was then discarded. The precipitate was dissolved in hot dH2O (67˚C), followed by the addition of an equal volume of phenol solution (90% w/v) and maintained at 67˚C for 15 minutes. The mixture was cooled on ice and centrifuged at 8,000 g and 4˚C for 30 minutes and the aqueous phase (upper phase) was separated and precipitated with five volumes of cold methanol reagent (99 parts of methanol and one part of methanol saturated with sodium acetate). The precipitate was dissolved in dH2O, dialyzed, and lyophilized. A suspension of 75 mg of this material in 9 mL of 0.01 M Phosphate-Buffered Saline (PBS) (pH 7.2) was treated with 0.75 mg of RNase and 0.75 mg of DNase and stirred overnight at RT. Next, 0.75 mg of proteinase K was added and the mixture was stirred for two hours at RT. The mixture was centrifuged and the pellet was washed with ddH2O until the optical density of the supernatant at 260 nm became less than 0.05. The last precipitate was resuspended in ddH2O and lyophilized. Next, 20 mg of lyophilized material was resuspended in 10 mL of a ddH2O solution containing 25 µL of triethylamine (Merck, Germany), followed by stirring for one hour at RT, and centrifugation. The precipitate was resuspended in ddH2O with triethylamine, and the process was repeated two additional times. The supernatant fluids were pooled and against multiple changes of ddH2O at 4˚C and finally lyophilized. Chemical analysis of purified S-LPS and R-LPS was performed by measuring 2-keto-3-deoxyoctonate (KDO), phosphate, glycan and protein contents. The thiobarbituric method was used to measure (KDO) as a unique component of LPS and the most popular marker of LPS from Gram-negative bacteria (25). Phosphate and glycan content assays were carried out according to the method described by Ames (26), and Raff and Wheat (27), respectively. Protein content was measured by the Bradford method. The degree of purity and the quality of extracted S and R-LPS was tested by SDS-PAGE. Lipopolysaccharide-speciﬁc silver staining was performed according to the method described by Tsai and Frasch (28). Specific assessment of lipids and carbohydrates was performed with Sudan black (29) and periodic acid Schiff staining (30), respectively. Nucleic acids contamination was estimated by absorbance at 260 nm. 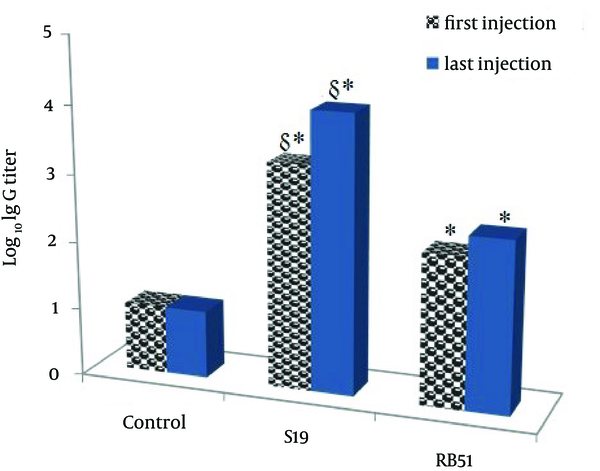 Groups of five C57BL/6 mice were injected subcutaneously with 0.1 mL of a solution containing 100 µg/mL (based on KDO content) of B. abortus S19 S-LPS in PBS (pH 7.2), or B. abortus RB51 R-LPS solubilized with a trace of triethylamine in PBS (24). The control mice group was injected with PBS alone. Mice were boosted two times at two-week intervals. Two weeks after the first and final immunization, blood was collected from the animals by puncture of the superficial temporal vein, allowed to clot, centrifuged and then serum samples were taken for evaluation of antibody responses and kept at -20˚C until use. All mice were then sacrificed and their spleens were aseptically harvested for in vitro cytokine production. Serum specific antibody molecules, elicited against the purified S and R-LPS, were monitored using endpoint dilution Enzyme-Linked Immunosorbent Assay (ELISA). The ELISA was performed in 96-well flat-bottom plates (Nunc, Denmark). The wells were coated with 10 μg/mL of purified S19 S-LPS in PBS (pH 7.2) or RB51 R-LPS solubilized with a trace of triethylamine in bicarbonate buffer (carbonate sodium-bicarbonate sodium; pH 9.6) and incubated for three hours at 37˚C and overnight at 4˚C. The wells were washed three times with PBS and 0.05% Tween 20 (TPBS), and blocked by adding a blocking buffer (1% Bovine Serum Albumin (BSA) in PBS) and incubated at 37˚C for one hour. After three washes, serial two-fold dilutions of the sera were added to the wells and incubated on a shaker at 37˚C for two hours. Next, Horseradish Peroxidase (HRP)-labeled goat anti-mouse IgG antibody (RaziBiotec AP8036, Iran) at a 1/5000 dilution was added to the wells and the plates were incubated on a shaker at 37˚C for 1.5 hours. After washing with PBST, 100 μL of tetramethylbenzidine (TMB; T4444 Sigma, USA), as the substrate of HRP, was added to the wells and the plates were incubated at RT for 30 minutes. Finally, stop solution (2N H2SO4, 50 μL) was added to the wells and the absorbance was measured at 450 nm using an ELISA plate reader. Endpoint titers were determined as the reciprocal of the highest serum dilution giving an absorbance value greater than the average absorbance of the negative control mice plus three times the Standard Deviation (SD) and were expressed as the group means ± SD for five mice. Also in the other test, the total levels of mouse IgG in serum were determined using commercial mouse IgG ELISA quantitation kit (Bethyl, INC, Montgomery), according to the manufacture’s instructions. The lower limit for detection of mouse IgG was 7.8 ng/mL. Values were presented as ng IgG/mL (mean ± SD, n = 5). Single spleen cell suspensions were obtained by gentle homogenization. Red Blood Cells (RBCs) were lysed by incubation in RBC lysis buffer (20 mM Tris, 160 mM NH4Cl, pH 7.4) for five minutes at room temperature, and the resulting splenocytes after two washes with RPMI 1640 (Biosera, USA), were resuspended at a density of 2 × 106 cells/mL in RPMI supplemented with 10% Fetal Bovine Serum (FBS), 2 mM L-glutamine, 100 U/mL penicillin and 100 µg/mL streptomycin. The cells were added to flat-bottom 24-well plates (Nunc, Denmark) and were stimulated with 10 μg/mL concanavalin A (Con A; C7275 Sigma, USA) or 10 µg/ml Escherichia coli LPS (L2630 Sigma, USA) and then incubated at 37˚C in an atmosphere of 5% CO2. For measurement of different cytokines, culture supernatants were harvested at 72 hours. The levels of the cytokines were determined using commercial DuoSet ELISA cytokine assay kits (R and D system, Minneapolis, MN), according to the manufacture’s instructions. The lower limit for detection of the cytokine was 32 pg/mL. Values were presented as picograms of cytokine/mL (mean ± SD, n = 5). Values are expressed as the mean ± SD. Significance of difference between treatment groups was determined by the student’s t-test. A value of P < 0.05 was considered statistically significant. More S-LPS was present in the phenol phase unlike R-LPS, which was more common in the aqueous phase. The quality of the purified LPS was investigated by the KDO assay, glycan test and different staining methods, following electrophoresis on SDS-PAGE. The chemical analysis data of purified S and R-LPS are shown in Table 1. The KDO is the most popular marker of LPS from Gram-negative bacteria. Based on KDO standard curve, 4.1 and 48 µg KDO were detected in one mg of purified S and R-LPS, respectively. According to the obtained results, R-LPS from RB51 had higher proportions of KDO (almost 12 folds) and less carbohydrate than the S-LPS from S19. This result was consistent with previous compositional analysis of smooth and rough B. abortus LPS, which revealed that KDO is the predominant glycose in R-LPS (10). Also, according to the glycan test, carbohydrate content of purified S and R-LPS were about 42% and 30%, respectively. a Abbreviations: KDO, 2-keto-3-deoxyoctonate; LPS, lipopolysaccharide. b The numbers represent percentages of total dry weight. SDS-PAGE patterns of purified S and R-LPS stained for carbohydrates, proteins and lipids are shown in Figure 1. In special silver-stained SDS-gel, purified S-LPS had a heterogeneous structure and seemed as a smear with two distinctive band zones, low and high molecular weight, which were associated with lipids and carbohydrates, respectively. However, R-LPS had a single diffuse band on the bottom of the gel due to missing O-side chain polysaccharide as expected. When the SDS-gel was stained for carbohydrates, single diffuse band was observed in S-LPS, yet there was a small band in R-LPS. Also, S and R-LPS showed different diffuse bands when stained for lipids. These results are in accordance with other published data about B. abortus LPS (17, 20). The electrophoretic profile of purified S and R-LPS contained very small bands in Coomassie blue or protein silver staining that demonstrated low content of protein in purified S and R-LPS. Anti S-LPS or R-LPS specific IgG antibodies were assayed two weeks after the first and the last immunization (Figure 2). The titer of specific IgG was significantly higher in mice immunized with LPSs as compared with control mice. S-LPS produced significantly higher antibody titers in comparison with R-LPS. However, total IgG amount of mice immunized with S-LPS, R-LPS and control mice was almost similar (365.6, 327.2 and 373.8 ng/mL, respectively). Groups of mice were subcutaneously immunized and boosted with purified S or R-LPS. Spleen cells of immunized mice were cultured in the presence of mitogens Con A or E. coli LPS in vitro and the cytokine profile were studied. Analysis of IFN-γ production revealed that neither S-LPS nor R-LPS could induce IFN-γ production (Table 2). Both S and R-LPS could significantly induce TNF-α, IL-4 and IL-10 secretion when compared to the control group. There was no significant difference between S and R-LPS in TNF-α levels whereas the level of IL-4 and IL-10 production in R-LPS was higher than S-LPS (Table 2). a Abbreviations: S-LPS, purified from B. abortus S19; R-LPS, purified from B. abortus RB51. Lipopolysaccharide is vital to the structural and functional integrity of the Gram-negative bacterial outer membrane (2). Brucella LPS exhibits properties distinct from other LPSs. In contrast to classical enterobacterial LPS, Brucella LPS are several hundred-times less active and less toxic than E. coli LPSs (31). In the current study, S and R-LPS were purified from S19 and RB51, smooth and rough strains of B. abortus, and then their biochemical and immunological properties were compared. Combination of different previously described procedures was employed for S-LPS extraction and purification in the present study. Use of proteinase K, protein precipitation with TCA and chromatography with guanidine HCl as the liquid phase in the purification process of S-LPS, led to decreased protein contamination when compared to other purification methods. As shown in Table 1, protein content in purified S-LPS and R-LPS is very low. Decreased protein contamination in purified S-LPS and R-LPS causes more specific immune response against LPS, since proteins are highly immunogenic molecules. Our results are consistent with previous studies, which showed that the chemical nature of S19 LPS is different from RB51 LPS. The level of antibody response in the sera of immunized mice was assessed by ELISA. In summary, immunization of mice with purified S-LPS or R-LPS generated high antibody titers in comparison to the control group; This indicates the fidelity and immunogenicity of purified LPS,and also demonstrates that employed purification process does not interfere with the natural and immunogenic structure of LPS. Absent of O-side chain in R-LPS led to a decrease in IgG production titer in mice as compared with S-LPS. However, measurement of the total levels of mouse IgG revealed no significant difference between the groups. Huang et al. (32) showed that B. abortus LPS or dead organisms equally induce substantial IL-10 production by murine spleen cells. However, only the whole bacteria or DNA were able to induce a high level of IFN-γ and IL-12 but a low level of IL-10 production. Evaluation of the cytokine profile produced in splenocytes of immunized mice indicated that both S-LPS and R-LPS failed to induce IFN-γproduction. Consequently, administration of 10 µg LPS alone in mice isn’t sufficient for inducing IFN-γ production. In this context, some studies have reported that LPS prepared from Brucella species either by trichloroacetic acid extraction or by hot phenol method does not release interferon upon injection into mice (33, 34). Nevertheless, Keleti et al. (9) showed that minimum effective interferon-production dose of Brucella LPS is 200 µg and intravenous injection of 200 µg LPS isolated from B. abortus strain 456 produced an interferon response in mice plasma with peak levels occurring two hours post injection. In fact, Brucella LPS alone is a much less effective interferon stimulus than the LPS isolated from Salmonella typhimurium, strain LT-2, which is active at doses as low as 0.1 µg per 20 g of mouse. Since interferon-releasing ability is a property of the lipid A portion of LPS (35), this discrepancy may be associated with differences in the lipid A structure of the LPS of Brucella and Salmonella. Furthermore, mass spectrometry analysis has revealed dramatic differences in the lipid A profiles of R and S Brucella strains when compared to E. coli lipid A (2). In terms of LPS capacity in stimulating IL-10 that is critical for the maintenance of immune homeostasis, Kariminia et al. (36) evaluated IL-10 and IL-12 production in response to LPS extracted from B. abortus (a field isolate) and B. melitensis vaccine strain (Rev1). They indicated that LPS from both Brucella strains are potent inducers of IL-10 in human peripheral blood mononuclear cell culture. Also, IFN-γ priming was able to significantly down-regulate IL-10 production and up-regulate IL-12 production in these cells. In addition, their results showed that the ability of B. abortus LPS to induce IL-12 in CD14+ cells is more potent than B. melitensis (Rev1) LPS. Our results are consistent with previous studies demonstrating that B. abortus S and R-LPS significantly induce IL-10 production in splenocyte cells as compared with the control group. Furthermore, Tumor Necrosis Factor- α (TNF-α) was produced following LPS stimulation as a pro-inflammatory cytokine. Jarvis et al. indicated that stimulation of RAW 264.7 macrophage-like cells by E. coli or RB51 R-LPS provokes synthesis of TNF-α, which is dependent upon phosphorylation of extracellular signal–regulated kinase (ERK) and c-Jun amino-terminal kinase (JNK) but not p38 kinase in mitogen-activated protein kinase signaling pathways. The RB51 LPS is two to three folds of magnitude less potent than E. coli R-LPS in terms of the elicitation of TNF-α from RAW cells. Thus, the less proinflammatory LPS of Brucella may contribute to its ability to survive as a chronic infectious agent in host macrophages (37). TNF-α has been implicated not only in the context of a link between innate and adaptive immunity, but also for optimal antibody responses and T cell survival when mice are immunized with Ag and LPS (38, 39). Our obtained results in the present study showed that S19 and RB51 LPS induced TNF-α in the same pattern. The amount of TNF-α secretion is much lower than those produced by E. coli LPS. Such moderate levels of TNF-α may help the host by promoting inflammation and priming the specific immune system. These data confirm that S and R-LPS are capable of inducing immune responses and may have potent adjuvant activity. Bacterial LPS is known as a potent adjuvant when administered in combination with protein antigens (40). Rapid recognition of the presence of LPS by cells such as monocytes and macrophages typically involves the release of a range of pro-inflammatory mediators. Notably, these innate responses are responsible for shaping adaptive immune responses. However, the clinical use of LPS as an immunological carrier has been precluded because of its toxicity and pyrogenicity. Less toxic and the non-pyrogenic nature of B. abortus LPS in comparison to other bacterial LPS can indicate its potential use as an adjuvant in vaccine design without need for detoxifying procedures. Brucella abortus LPS as an adjuvant, in combination with different antigens, in vaccine preparation may develop different immune response. For example Jamalan et al. (41) showed that the effect of B. abortus S19 LPS in skewing of the immune response to Th1 or Th2 pathway is antigen-dependent and a combination of 17th PPD fraction with B. abortus S19 LPS may be an efficient vaccine for immunization against Mycobacterium tuberculosis. In further researches, effect of different amounts of purified S-LPS and R-LPS as adjuvants in combination with different immunological determinants would be investigated. Result of these studies would be helpful in providing complementary and elucidative data about the potential use of B. abortus LPS as a safe adjuvant. We greatly appreciate the Institute of Biochemistry and Biophysics, University of Tehran and also the Brucellosis Department of Razi Vaccine and Serum Research Institute for their support. Funding/Support: This research was financially supported by the Institute of Biochemistry and Biophysics, University of Tehran.